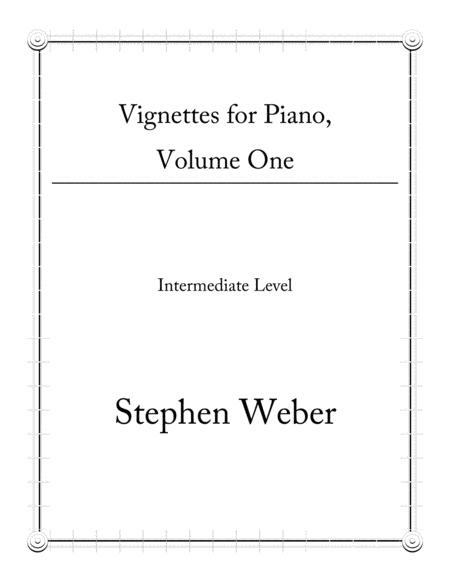 Composed by Stephen Weber. 20th Century, Contemporary Classical, Jazz, Repertoire. 17 pages. Published by Published by Dr. Stephen Weber (S0.223413). 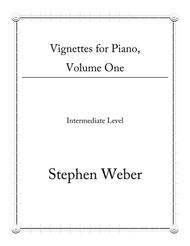 The eight selections in this collection, entitled Vignettes, are designed for intermediate level pianists. They are intended to be valuable teaching pieces, but also work well for student performances on concerts. Each piece is between 1 to 3 minutes in length. The pieces are stylistically diverse, and many are built on quickly learnable patterns. Though most are firmly rooted in traditional harmony, many incorporate contemporary compositional techniques, idioms and vocabularies. Dr. Weber is a member of ASCAP. His personal website is: www.stephenweberdr.com. He also has a YouTube channel, at which you can hear many of his original compositions and samples of his performances in the U.S., Europe, and Asia. Weber currently serves as Professor of Music and Chair of the Arts and Humanities Division at the University of Science and Arts of Oklahoma. .